The Akeman Street – Stretten Avenue junction. There are bare patches and broken curbs, but £17,750 appears a huge amount to spruce it up. 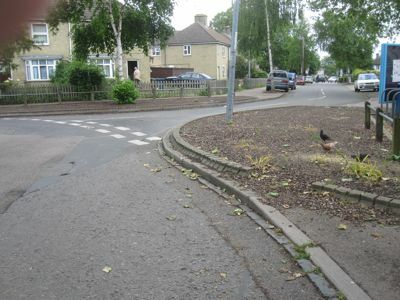 At Cambridge City Council’s North Area Committee on the 10th of June 2010 councillors approved the spending of an astonishing £17,750 on plants, and a few new curbs, for Akeman Street in Cambridge. The money is to be spent on the Akeman Street – Stretten Avenue junction. This latest approval of funds is just a small part of the total being poured into Akeman Street; it follows councillors’ approval of £4,750 in November 2009 for new plants outside the shops in the middle of Akeman Street and while debating what to do with the remainder of their “Environmental Improvement” funds councillors at the June 2010 North Area Committee they pencilled in the possibility of spending a further £20,000 on planting around Akeman Street’s junctions with Darwin Drive though spending this latter sum was not formally approved at the meeting. As yet there is no sign of any planting by the shops and councillors have not been updated on what has happened to the money they allocated in November 09. £4,750 – Planting outside shops. 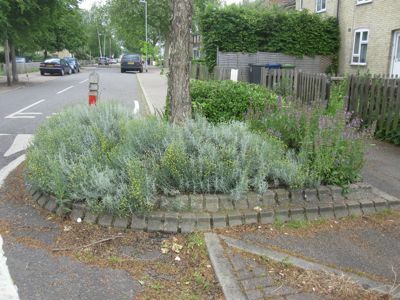 £17,750 – Planting and curbs at Akeman Street / Stretten Avenue Junction. 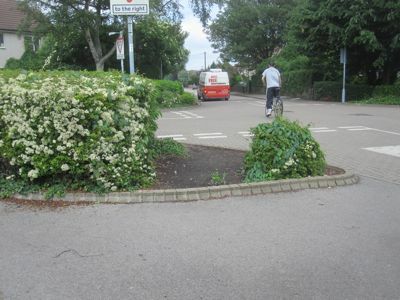 £20,000 – Planting at Akeman Street / Darwin Drive junctions and round trees. I have looked at the areas which are being considered for replanting; and while I’ve not taken a tape measure out I estimate that councillors are looking at throwing about a thousand pounds per square meter at the works on Akeman Street. I wonder if any of these councillors would spend their own money as profligately as they appear to be willing to spend mine and other taxpayers’. No restrictions on spending appear to have reached our Liberal Democrat councillors in the North of Cambridge; there are no public sector cuts in evidence here. While debating the “Environmental Improvements” Cllr Boyce appeared to joke that a “community call to action” might be cheaper; his fellow Liberal Democrats all laughed at his suggestion which was clearly not being put forward in all seriousness. Clearly the council (why not the County?) have to repair the curbs, but the planting could done in conjunction with local residents – some of whom I know would love the council to positively engage with their guerrilla efforts to improve the area’s planting and will be astonished to learn of the sums of public money being deployed inefficiently. 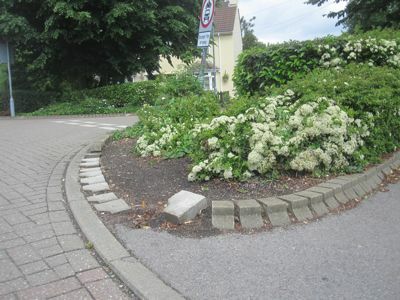 Broken curbs at the Stretten Avenue – Akeman Street junction have been made safe but need repairing. Throughout the city bricks have been used where concrete would have been cheaper and more durable. No detailed proposals for any of the planting works have been put to the councillors in a public meeting. At the June 2010 council officers’ estimate for the cost planting on the junction had risen from £8,000 to the £17,750 approved. No councillor questioned the reason for this enormous jump. Councillors were unclear as to if their approval of the work was subject to consultation or not. They certainly didn’t direct officers as to who should be consulted in any such exercise. The planting decision was made unanimously by all the North Area’s city councillors, all of whom were present at the meeting. This junction is in a poor state and has been discussed many times at the North Area committee over the couple of years I have been observing. County Cllr Moss-Eccardt, who was absent from the June 2010 meeting which approved the spending has previously called the design of the junction a failure. Pedestrians are supposed to be directed away from the junction, however people ignore where the pavements go and many walk in the road, or more recently as the planting has got more sparse, people have been walking across the mud in the planting area. 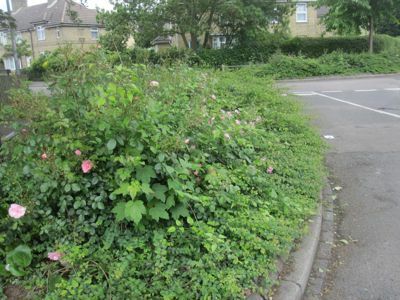 Councillors have many times debated the height of the shrubs, and appear to have agreed that the high shrubs obstructing vision are to an extent desirable as a traffic slowing measure. 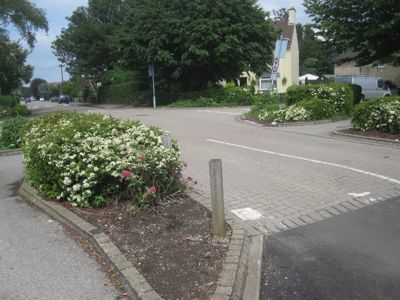 The current spending of £17,750 is, according to the meeting papers and the decision I observed, just for repairs to the curbs and some new plants; it is not seeking to address the underlying problems with the layout of this junction. Perhaps had Cllr Moss-Eccardt turned up he would have been able to persuade his colleagues to get better value for the astronomical sum they committed to spend. Pedestrians take the path of least resistance – in this case through the planter; many walk on the road. The pavement runs to the left. Akeman Street planter full of colour and interest. 20mins pruning would make it very smart in my view. Another impressive Akeman Street planter; in need of no more than a bit of a trim. Caution: The North Area Committee Chair Liberal Democrat Ian Nimmo-Smith chastised me during the committee’s proceedings saying: “you don’t understand what goes on at meetings”. I thought I would report that here so those reading can take his view into account. This entry was tagged Arbury, North Area Committee, Public Money. on June 11, 2010 by Richard Taylor. Is there anything to suggest that the Council is using S106 monies for these improvements? If so, then this is money collected from developers to mitigate the impacts of their developments and not at the cost of the taxpayer. Having said that, there is always something of a disconnect between the benefit sought by the Council and the impact of the development that may be taxed! The council’s criteria for Environmental Improvements Funding are appended to the report to the June North area committee which I linked above. One criteria is that schemes must not be eligible for other sources of funding such as S.106. I’m not sure it is that clear cut though; as there has been a suggestion that the Riverside scheme is to receive S.106 funds despite being classed as an environmental improvement going though the area committees. Details of S.106 payments collected and how they are allocated, and how efficiently they are being spent, is one of many areas where despite great public interest the council isn’t very open. S.106 payments, especially where they are not directly related to enabling a development to go ahead which otherwise would have been refused planning permission are just taxes on my view. Particularly where the money is not allocated for a particular purpose it is public money which councillors, on our behalf, decide how to spend and ought be spent just as carefully as that raised through income tax, council tax or any other tax. The latest edition of the “Arbury Neighbourhood Community Project” magazine was delivered to my house today. An article on p.2 states that the Arbury Lib Dem Candidate Amy Ellis(who lost the election) has has, along with her children, been digging up the flowerbeds / tree pits in the Darwin Drive / Akeman Street area and planting flowers. I think this is excellent and shows there was no need to spend £42K of public money in the area. I also question though if this activity was done with the knowledge / support of the city council. Councillors were certainly not made aware of it when approving the £42K, though local councillors did report that unofficial planting carried out by shopkeepers had been removed by the council. I hope the LibDems are not spending public money undoing the good work done by one of their candidates. We’ve discussed this a bit on Twitter, but you make it sound like it was just Amy & her children doing the bulb planting. In fact the article says it was a couple of dozen people, organised by Amy on behalf of a local residents association.